In Linux (or Unix) world, most network interfaces, such as eth0 and ppp0, are associated to a physical device that is in charge or transmitting and receiving data packets. However, there are exceptions to this rule, and some logical network interface doesn't feature any physical packet transmission; it is possible to design network interface drivers that rely on other interfaces to perform actual packet transmission. The idea of a ``virtual'' interface can be useful to implement special-purpose processing on data packets while avoiding to hack with the network subsystem of the kernel. Insane (INterface SAmple for Network Errors) driver is an interface which simulates semi-random packet loss or intermittent network failures. The original code of the insane driver has been written by Alessandro Rubini and tested with Linux-2.3.41. A detailed description of the source code and instructions on how to use insane can be found in the original Virtual Network Interfaces" article. 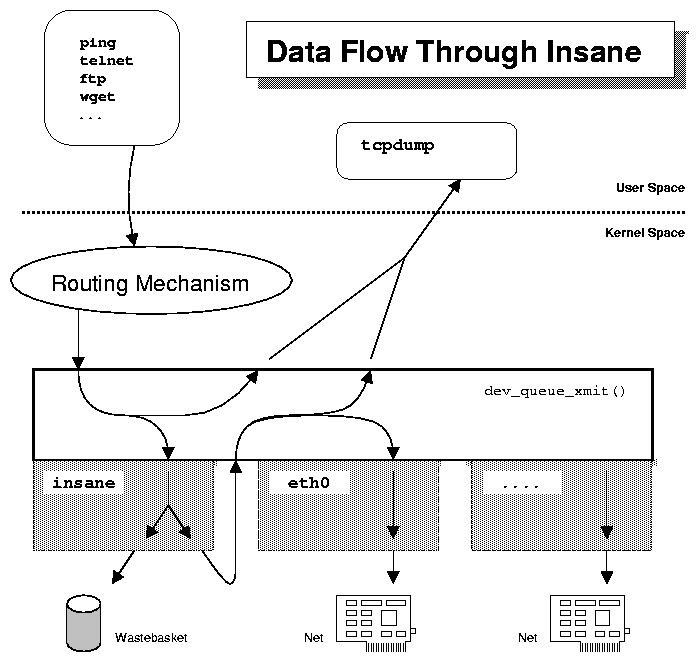 In Summer 2009 Dr. Filippo Bistaffa rewrote ported insane driver to Linux 2.6.31, also correcting a memory leak bug and comparing the performance of insane to these of iptables statics module and tc netem. The source code of insane 2.6 can be freely downloaded below.